Accordingly, the group's pastor was a professional exorcist. He explained to me once (the only time we conversed) that, in his world-view, there are thousands of poor souls possessed by multiple demonic forces and it was his "calling from on High" to devote his life to expelling these demons back to Hell. His religion took the form of a war between good and evil - a stark, simple contrast. Which side are you on? The fact that I study and teach comparative religion clearly put me in the wrong camp. Members of this congregation were warned that merely watching a documentary on non-Christian religions - say a TV program about Hinduism - was enough to lead to demonic possession. This particular group took to such creepy practices as holding prayer vigils in front of the homes of naturopaths - since reiki and acupuncture etc. were deemed forms of "occultism". Thus naturopaths and their patients were in dire threat of demonic possession and needed "spiritual cleansing". This type of religion is silly at best and dangerous at worse. In any case, it is unhealthy. To be preoccupied with evil - as if the love of God is not the best protection from evil - is always unhealthy. People start seeing the Devil all around them and feel beseiged by malignant forces. In many cases it leads to forms of paranoia and in extreme cases religious psychosis. I have come to mistrust so-called "exorcists" and those whose religious outlook is defined by what they are against. I advise people to avoid forms of religion driven by this type of grotesque and self-righteous negativity. I don't like self-appointed warriors, especially those waging self-defined battles against imaginary foes. In all walks of life it is wise to stay clear of fear-mongers. Fear of God is one thing - it is a healthy religious emotion that contextualizes one's mortality - but it is another thing to be wracked with fear because you see the Anti-Christ lurking in every shadow. Unfortunately, this is a malady that inflicts not only small, zealous evangelical congregations; we find it in more systemic forms among those who should know better. I have been especially concerned by the intrusion of this type of world-view among the so-called ‘Traditionalist’ ( or as I prefer ‘Perennialist’) school of religious studies. This is a body of thought to which I have had substantial links. I am a long-time and enthusiastic reader of many ‘Perennialist’ writers: Rene Guenon, Frithjof Schuon, Titus Burckhardt, Ananda K. Coomaraswamy, et al. 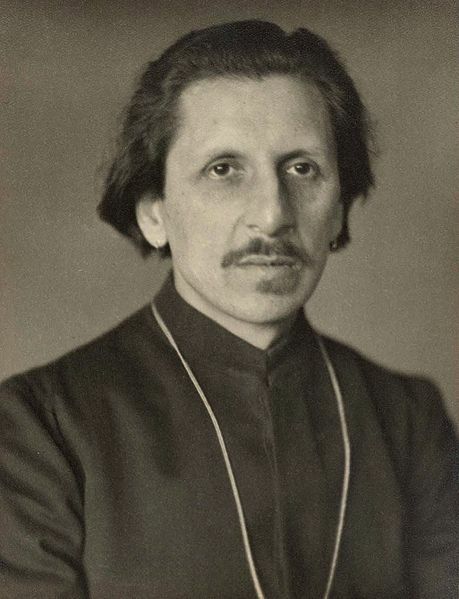 I am increasingly concerned, though, at the influence of a second-generation ‘Perennialist’ Rama P. Coomaraswamy (see picture above), and his particularly narrow, paranoid perspective. As the son of the famous Ananda K., Rama P. is a figure of much prestige in ‘Perennialist’ circles, but while his father was a Hindu who devoted his life to expounding the virtues of the traditional arts, Rama P. converted to Catholicism and, in this, embraced the hard-line ultra-conservative doctrines of the reactionary Bishop Marcel Lefebvre. At the same time, Rama P. moved from a noble career as a heart surgeon to a dubious career as a psychiatrist/exorcist, a professional demon hunter. His writings are mainly concerned with denouncing the evils of the Second Vatican Council (he takes an extreme anti-modernist position and regards the modern Church as heretical) but in some of his works (such as the essay ‘Spiritism’s Role in Exorcism’) he indulges in the same spiritual warfare scenarios as the pastor I described above. For Rama P. all the manifestations of the ‘New Age’ – and much else besides – are the work of sinister supernatural forces, the connivance of the Devil himself. In his later career the younger Coomaraswamy devoted himself to medicating, lobotomizing and exorcising what he saw as Satan’s countless victims. I love his father’s works – brilliant essays on oriental art, philosophy and metaphysics. But to be frank, Rama P.’s works I find disturbing and in places chilling. The conjunction of psychiatry, exorcism and ultra-conservative Catholicism leaves me with nightmares and is as far away from my ‘perennialism’ as can be. It is a matter of concern to me that many ‘Perennialists’ today seem to hold up Rama P. as the current standard of uncompromised “tradition”. This represents a hardening into intractable zealotry. Compare Ananda K. with Rama P. Ananda K. was a scholar of great insight. Rama P., by contrast, is a zealot and a propagandist. Rama P. has turned perennialism’s exposition of traditional spirituality into an apology for ultra-conservative Catholicism and its critique of modernity into a crusade against Satan, a witch-hunt. I value perennialist writings for their dissection of the many pseudo-spiritualities of our time. In the writings of Rama P. these pseudo-spiritualities are not just errors and distractions, they are the vile works of the Devil and all but the ultra-conservative few are under his sway. It is the emphasis on evil that I find most distasteful. I’m sure that the more we think about the Anti-Christ the bigger he gets. I have seen this in other contexts too. I once knew a young woman convert to Islam who had spent time studying in a traditional religious school in Malaysia. She became so immersed in a world populated by devils and evil spirits that whenever she heard a dog bark she would hide under the table terrified and muttering curses against “Shaitan” in Arabic. It was clear to me that the school she had attended was in the business of striking terror into young adherents and then consoling them with exorcisms and protective charms. Similarly, among the neo-pagan fraternity I have seen “occultists” of various sorts – wiccans, mages, Druids, soothsayers and spell-casters – whose spiritual life takes the form of psycho-spiritual battles against a host of elves and goblins. I long ago decided that this is not my idea of a healthy religious life. It is pathological. In a sane, robust religious life the emphasis is on such virtues as joy, generosity, forgiveness and an openness of spirit. The hardening of religion into a catalogue of demons and of priests and doctors into exorcists wielding holy water (and thorazine) is itself a sinister development.